Read the full article by Mark P. Robinson, Jr. and please post your comments. We look forward to your feedback. This entry was posted in Uncategorized and tagged American public, civil jury trial, jury system, jury trial, Save Our Juries on July 8, 2014 by jagd. In the 43 years I’ve been practicing civil litigation, I’ve seen all sorts of jurors: from the highly educated to those who could not read the words of the oath, from copious note-takers to those who fought a battle to stay awake, and those who winked at me just before rendering a verdict against me. I’m done trying to read juries or predict their verdicts. This experience begs a thought-provoking question: why am I so alarmed at the vanishing jury trial in civil cases? There are a number of good reasons. Despite the failings of individual jurors, juries get it right most of the time. Think back to miscarriages of justice in your own practice. You’d be hard pressed to find one where the fault lay with the jury. Overwhelmingly, the miscarriages have been due to failures in other parts of the court system – by experts, by witnesses, by lawyers, or even judges. Juries are democracy in action. There is no other part of the Constitution where ordinary people participate in daily decisions of such immediate importance. Citizen jurors wield real power by settling the fates of their fellow citizens in courts throughout this great nation. Juries bring with them freshness and insights of those who are new to the system and have not become case-hardened or cynical. However, juries are not naive either. Jurors are experts at detecting the truth when faced with conflicting accounts of witnesses. They are also experts at deciding fair and reasonable damages – or no damages at all when the plaintiff’s proof is lacking. By bringing ordinary citizens into the system and placing them at the very heart of the decision-making process, trial by jury exposes our civil justice system to their scrutiny while ensuring they gain first-hand experience of how that system works. This garners trust in the system. 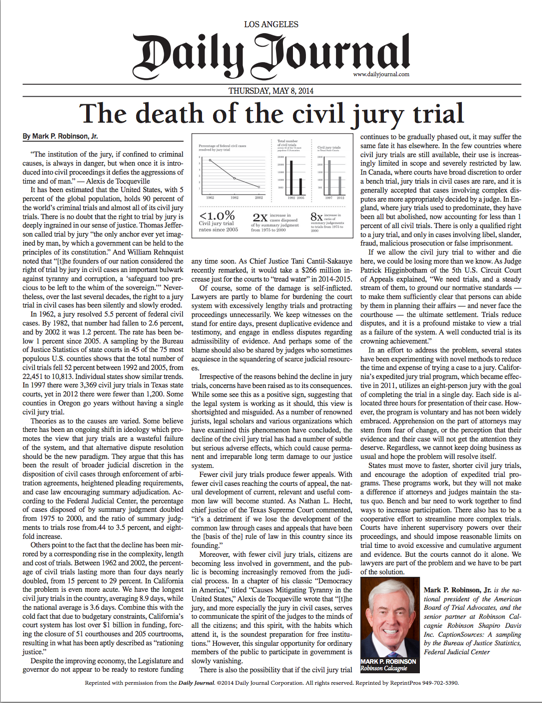 Trial by jury helps the civil justice system reflect the values and standards of the general public. It’s vital for the health of our civil justice system that citizens ­participate in it. It is vital for democracy that they do. These are reasons why I’m so committed to the Seventh amendment and the goals of ABOTA. It is also why I am committed to reversing the trend of vanishing jury trials in civil litigation. Otherwise, our democracy takes a serious blow and loses part of its vibrancy.